The app I'm designing allows people to describe organizations and individuals by selecting items from a list of predefined characteristics. A characteristic belongs to exactly one category. Categories are nested at most three levels deep. Each characteristic belongs to one or more industries (medical, IT, automotive, etc.). Each industry contains at least 250 characteristics. As you can imagine, the list of selectable characteristics can become pretty large, especially when characteristics from multiple industries are displayed simultaneously. Being able to provide the customer with such a large set of predefined characteristics is exactly what makes our product valuable. However, during initial tests, we found that users were overwhelmed when presented with this long list of choices. It's just too much. Also, users have trouble finding the characteristics they are looking for. How can this design be optimized? How to make working with such a large list of choices more manageable? Are there existing solutions we can take inspiration from? Any best practices/patterns/principles? How would you solve this problem? I'm thinking about adding additional navigation to help the user browse through the categories. I'm not sure if that would be a substantial improvement. I'm willing to go in an entirely different direction, but I'm out of ideas. How can this design be optimized? Make a few prototypes, think of a way to describe one or more common tasks then put them in front of actual users. Take note / ask them about their experiences. Look out for friction points. Measure the efficiency (time it takes to complete the tasks) and effectiveness (accuracy / number of successful completions) of each prototype. Are there existing solutions we can take inspiration from? Maybe look to some of the other giants of the survey world - such as surveymonkey. Sounds a bit like some of their matrix/rating scales might be good inspiration for you. "I'm thinking about adding additional navigation.." before you do, consider how one of the winning watchwords of good UX is often that simplicity is key. Less is more. UX is like a joke. If you need to explain it, it's bad. Hundreds of items in a single list is overwhelming even with a collapsible tree structure. It could still work if your users always know what they are looking for and can intuit what categories those things would belong to, but if you instead are anticipating or seeing more of a "browsing" use case then finding a clean way to separate the overall list into a handful of smaller, more focused lists can help keep users appropriately whelmed. 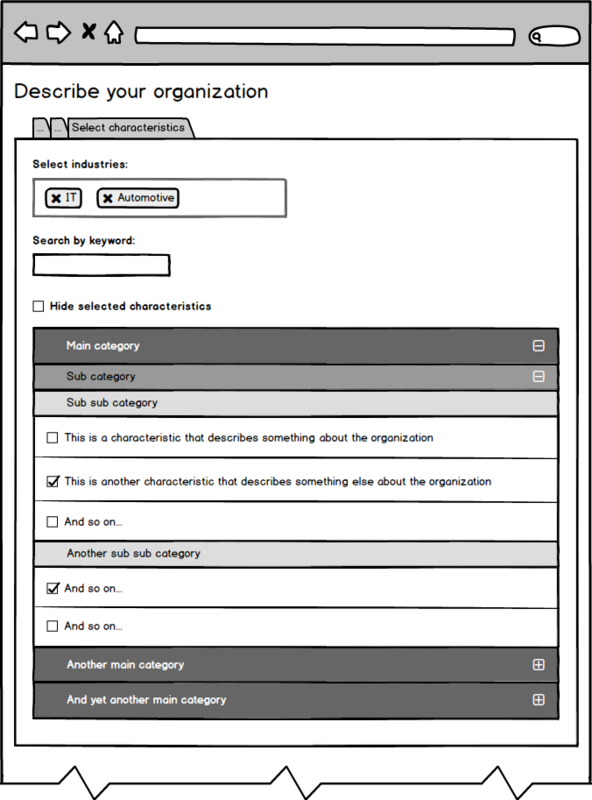 For example, your mockup presents a single page of "select all characteristics for all industries of this thing". Perhaps the user could instead go through a series of pages or distinct wholly collapsible subsections; an example division could be "Choose some positive characteristics of Foo in the IT industry" for each of positive, negative, and neutral for each applicable industry. This could result in a frustrating increase in the number of steps, especially if they don't choose any characteristics on several pages. It's certainly a balancing act between the two extremes and it's important to get the divisions correct to have a reasonable number of items on each page (rather than ending up with 1 item on each of the first two pages and then 248 on the last, for example). A related, but more general strategy is simply to improve your grouping. I can't say how impactful this currently is without probably talking with or observing the users who tested the system, but a potential problem could be that your groups make sense, but are actually organized in a way that your users often need to open almost all of them along the way. If your users can instead skim the top level of categories and immediately know that they only need a few of them then that will hide a large number of irrelevant options. Finally, if it's possible to get a deeper understanding of what exactly users are doing with the interface that could help identify what improvements are most necessary. "Overwhelmed" could mean a lot of things. For example, if your users are having trouble because they open every single category and sub-category to scan all the characteristics for ones that apply then that will have one solution, while users that reach the page with specific characteristics in mind and struggle to discover its location within your grouping hierarchy will want different changes, and users that look through the list and struggle to even understand what the groups and characteristics on the list actually mean need yet another fix. It's good that you have actual feedback already, but it's still a bit too vague. Like others have stated before (and I've found in my previous projects) accordions are really difficult with large amounts of data. May I recommend a tabbed interface replacing the subcategories in the accordion. That should make the subcategories more viewable, and easier to see the exact context you are in at any given moment. Don't dis it till you try it. Tabs solved a really difficult 'too much data' problem I had on another project. Another good help with the problem would be to create an area for the most commonly used characteristics in that profession. My other solution comes in the form of a question, how many users used your search box? I think that your search box could be really powerful. I would either make it more emphasized if users were missing it all together. If users tried using it, and it didn't work particularly well, I wouldn't give up on it and try getting a smarter algorithm or more data to match the searches. Not the answer you're looking for? Browse other questions tagged interaction-design web-app lists selection choices or ask your own question. How do you scope a UI redesign project without missing anything important?